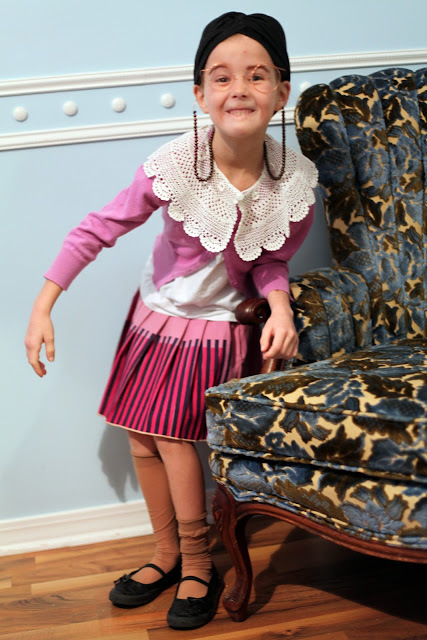 It was the 100th day of school today! (already?) 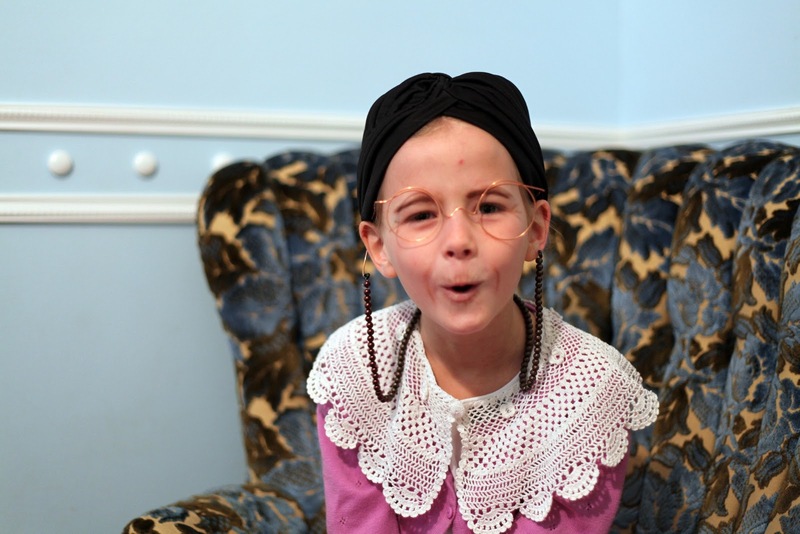 The younger grades always do something fun to celebrate and this year, Olive's class got to dress up like 100 year olds. Olive and I worked on her costume yesterday, stopping at the dollar store for her old lady turban, flesh colored knee highs and some brown eye-liner for her wrinkles. She was ecstatic when I got my make-up out, but she wasn't too pleased when she looked in the mirror and saw an old lady face. I reminded her she wasn't dressing up as a princess. My favorite were the slouching knee highs, but I don't think she wore them that way. As soon as she was out of sight, she might have been wiping off her wrinkles (if only it were that easy) and pulling up her stockings. Her sisters did vouch that she was the best looking 100 year old at school today, even if it was a homemade costume, they added. Thanks? Everyone in Azure's class brought in 100 of any object. And of what do I have more than a hundred? That's right. Just looking at them makes me want to tackle my sewing machine so I can put them to use. Sometimes I take things to Good Will and snip the buttons off first. Is that rude? 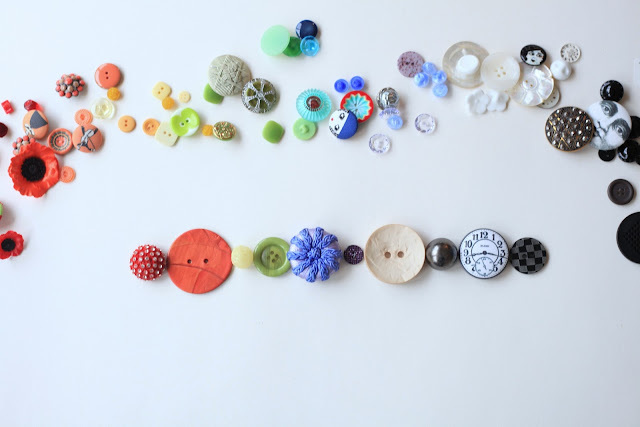 I admit I have a bit of a button obsession. Other times I start a project based on the buttons. A bit buttoncentric, I'll admit. I might be the Buttonics Anonymous president, and I don't plan on resigning any time soon. Vintage, new, glass, fabric covered, round, square, I love 'em all. Of what do you have more than 100 and proud of it? My oldest is in kindergarten, so I am new to the 100 days projects! He decided to cut out and sew 100 pieces of fabric into a blanket. This mama is awfully proud! And I love the wrinkly flesh coloured pantyhose. Perfect! I think I reach the hundred in the amount of clothing I have in my bins to up-cycle, mostly XL t-shirts that people around me wants to throw away. That hundred things seems like lots of fun! we never had any fun activities in my school. Love the costume! I almost clipped some buttons before sending a cardigan to DI. Maybe I will next time! As for things that I have a hundred of, how about piano books? Patterns. I'll put it this way--I just packed them up and ended up with two medium sized moving boxes full... and those are the ones I like and want to keep. I have three other smaller boxes of patterns I want to sell, and a kitchen garbage bag full that I have yet to go through! Awww she is cute as a button. Adorbs. I hope she kept the scrunched knee highs all day. They are the icing on that old cake! I would probably say I have over 100 different pieces of fabric, well probably over 1,000 if I actually counted, but I have never seen all of it in one room as the wools live in the attic, some of it is in tubs in the garage, and some of it is in the studio. Jennyroo--You OUGHT to be proud! What a fun idea! Andreann--I feel ya. I've started to just donate things I know I'm not going to get to. Bratling--and I thought I had a lot. Cute post! Love the costume. I just did a post with the same title....but it was REALLY about my grandma who just turned 100, and she actually spoke today at my sisters kindergarten class for their 100 days of school!! What a clever post -- and what a youthful old lady! I love that button with the watch design!!! how cute is she? I love the costume! What a fun idea - we don't do stuff like that in the UK (at least not at my children's schools/pre-schools). The only thing I really have more than 100 of has to be books - more like 7 or 800! Unfortunately most of them are in boxes in the loft since we moved as we don't have as much built in shelving yet, and I have to keep reusing *my* bookcases for other things - like the children's books (easily another 100), oh and for storing all my sewing/crafting stuff on. Zero the hero comes to my school on the 100th day. He passes out lifesavers, which is always fun. I love the old lady costume! I bet she was the best dressed old lady. Marianne--that is SO cool! What a wonderful woman. I absolutely LOVE Olive's outfit! I taught for one year as a Kindergarten teacher and I think it would have been so interesting to see what 5 and 6 year olds thought 100 years old looked like. On another note I ADORE buttons as well. I think it is because my Memere (my mom's mom) had a metal can with buttons that she gave to my mom. I loved shaking the can, sorting the buttons, picking out my favorite, and lots of other things. I love your blog and being able to admire your creativity and ideas. Oh ma' goodness, does she look so cute! I offered my little Kelly buttons, but she started out wanting "crafting what nots". I thought we could glue them to a glittery white branch, which turned her off immediately. Then, her eyes lit up, and she knew she just had to take in her dice collection. Yep, my 4 year old has been collecting dice for 2 years. Her sister took 100 hearts, and I patchworked a dress for her with 100 squares of heart fabric. I think for Kelly, I'll use what I have and make a "Goodnight Gorilla" dress...I've been inspired by your "Once Upon A" series. I've been wanting to make a Goodnight Gorilla tribute. I will share it if I get it finished. Oooh! Buttons!! I have old tins and jars filled with buttons! I love to go through them and pick out my favorites now and then. I also have lots of marbles, and I think it would be easier for me to let the kids take 100 buttons than 100 marbles. I've had some of those marbles since I was a kid! Make sure Azure brings those buttons back home! :o) And Olive is the cutest 100 year old I've ever seen! I only hope I'll be that cunning when I'm 100 years old. I cut the buttons off of my Goodwill donations before sending them too! Also, when Goodwill is doing their 10 for $10 sales, I will buy articles of clothing only for their buttons. I've been collecting thimbles since I was 10, and I think I have close to 300. They're from all over the world, made of porcelain, glass, jade, coal, metal, cloisonne, and even deer antler. I have a collection within a collection of vintage advertising thimbles. Any time I go somewhere new I hunt one down! You didn't give your 100 buttons to the school, did you? I probably have 100 pairs of running shoes (or cross-training, etc) that I can't let go of. Love the wrinkled Nora Batty socks... very authentic. Hardcover books. I'm actually afraid to count them but I'm pretty sure I have at least 500. This is what makes it so difficult to move. Love the old lady costume! Greatest ever old lady outfit. And the face! A little too cute for an old lady. 100? Hmmmm. !00 silk thread colors from Korea, I am sure. That's funny ! My daughter's school is having the same thing on Wednesday, and she is going to bring 100 buttons, too... because I have them. And she has to dress as a 100-year-old. Great pictures ! She's the cutest little old lady I've ever seen! And if something I'm donating has really good buttons, I totally keep the buttons. There's no sign saying "donations accepting only if all the buttons are intact" and I have a right to keep my buttons, I think! ;) I cut the crystal heart buttons off a vest just the other day, I just know they'll make a splash on something adorable for one of my girls!